II first encountered the work of Martiza Torres, a Los Angeles based artist, through the San Antonio zine collective St. Sucia. Specifically, St. Sucia’s zine Issue 2: Dos Mundos, the cover of which was graced by her 2014 drawing Lookin For Change. The marker drawing depicts a pre-Columbian hot mess, a contemporary mujer dressed in regalia inspired by ancient Mesoamerican luxury: a headpiece of quetzal feathers fluttering about, strings of jade beads, and a jaguar jumpsuit along with huaraches. Her long, flowing black hair and Maya blue skin immediately capture the viewer’s attention as she rummages through her overflowing purse in front of the entrance to a diner or perhaps a nail shop. Torres’ drawing and the works by other contributors in this issue are focused on navigating the two worlds many Latinx folks encounter while living in the USA. This zine issue includes stories from many individuals who exist in the various spaces that are nestled in the borderlands and between the binaries of personal identities. 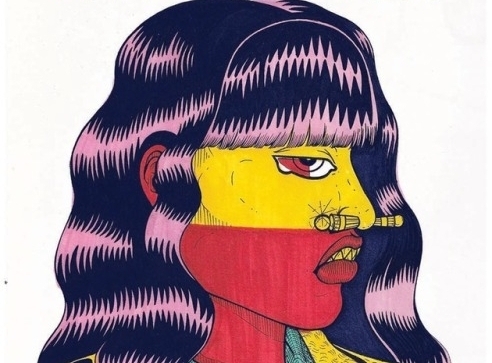 Torres’ work is an illustration of this: her work is a visual fusion of a Mesoamerican cultural heritage set against a background of modernity, but also a cultural nostalgia for indigeneity that many multi-generational Chicanxs and Latinxs have a connection to. In some of her work, she uses visual elements from Maya and Aztec codices as a contemporary articulation of femininity and cultural identity. Her work overall is a synthesis of syncretic identities and belief systems that she personally explores through her studies of history, religion, and other cultures beyond Mesoamerica. I first encountered the work of Martiza Torres, a Los Angeles based artist, through the San Antonio zine collective St. Sucia. Specifically, St. Sucia’s zine Issue 2: Dos Mundos, the cover of which was graced by her 2014 drawing Lookin For Change. The marker drawing depicts a pre-Columbian hot mess, a contemporary mujer dressed in regalia inspired by ancient Mesoamerican luxury: a headpiece of quetzal feathers fluttering about, strings of jade beads, and a jaguar jumpsuit along with huaraches. Her long, flowing black hair and Maya blue skin immediately capture the viewer’s attention as she rummages through her overflowing purse in front of the entrance to a diner or perhaps a nail shop. Originally from Murray, Utah, a suburb outside of Salt Lake City, Torres moved to Los Angeles in 2001 to attend The Fashion Institute of Design and Merchandising, where she received her associate’s. She ended up at FIDM because she didn’t believe she could be an artist: “even though my parents were really encouraging they didn’t see [being an artist] as something sustainable.” She hoped to land a job that would help her family back home in Utah, but she soon realized that the fashion industry was not the creative outlet or industry she wanted to create for. Feeling confined by the fashion industry’s modus operandi—creativity by imitation, questionable outsourcing of production, and products sold for cheap holiday pricing—she eventually left the industry to become a full time artist in 2010. However, both of her parents ensured that their children would learn their ancestral and cultural identity through other media that go beyond the overt stereotypes seen through mainstream media. Torres recounted how her mother crafted family art projects that highlighted their cultural background, such as the making of piñatas or participating in folklorico dance, as a solution for entertaining her six kids at a reasonable price. While her mother established a creative outlet for her family, her father instilled pride and knowledge in their heritage and cultural background. He would recount stories of Aztec myths and legends, such as that of Ixtaccíhuatl and Popocatépetl, the dormant volcanic mountain peaks in Mexico, tied to the infamous myth of the princess who fell in love with the warrior. Influences of her cultural background are apparent in her work but they are not the sole focus of her style. Her artwork fluctuates between indigenous iconographies but also fierce, sometimes grotesque, figures with fanged teeth, extra fingers, and lizard-like tongues, who Torres describes as empowered women. They are figures that exude their confidence through snarled lips, pointed gazes, and grunge rock aesthetics. One of her impressive works from this series was Quetzalcoatl and Mictlantecuhtli Reimagined. The drawing is sourced from the Codex Borgia, an ancient Mesoamerican pictorial manuscript that details sacred rituals, narratives, divination, calendar, and religious beliefs. Created before the Spanish conquest of Mexico, the codex was later taken to Europe during the Spanish Colonial period and ended up in the collection of a distant relative to the House of Borgia. In Torres’ drawing, she replicates page 56 of the codex, a scene that refers to the origin of the Aztecs under the fifth sun. The myth describes that after the gods Tezcatlipoca (god of the nocturnal sky) and Quetzalcoatl (god of wind) recreated the fifth world they were in need of people to repopulate it. It was decided that Quetzalcoatl would go down into Mictlan (the underworld) to retrieve the human bones of those who perished in the previous fourth world. Mictlan, known as a dangerous place filled with nine different levels, is run by the skeletal god Mictlantecuhtli, depicted as the white skeletal figure on the left side of page 56. When Quetzalcoatl entered Mictlan and asked for the bones, Mictlantecuhtli was skeptical and required that he complete a few simple tasks, mainly as a trap to make him fail in his mission. In the end, Quetzalcoatl succeeded and delivered the bones to the old goddess Cihuacoatl (goddess of fertility) to be ground into a flour-like substance and sprinkled by the blood of the other gods; from this the human race was born. In Quetzalcoatl and Mictlantecuhtli Reimagined, Torres recreates the exact pose of the two gods faced back to back with similar hues and styling from the codex. The figures carry the same symbols and regalia but are revised within Torres’ distinct style of precise outlines, soft and flexible forms, and an empowered woman perspective. Quetzalcoatl and Mictlantecuhtli are depicted as full flesh women with billowing, curly, wavy green hair, and painted toenails. These are empowered figures that maintain their iconographical god status, but they are transformed corporeally into fierce women. Mictlantecuhtli is not a mere skeleton, she is a woman with muscle toned arms, a Mohawk hairstyle, and exposed breasts, with an amputated hand as an earring. Discussing her life and work this past summer, Torres noted that, although her work is produced from a personal perspective, it also functions as a political act. It is a reflection of her everyday life, and, as she describes, her continuous work “to stay woke, to be conscious.” Her work is a practice of introspection into her cultural heritage that began at a young age, from her father’s retelling of Mesoamerican myths, gods, and beliefs and continuing with her current studies of codices and other ancient American, indigenous, and Chicanx belief systems, in addition to other cultures.